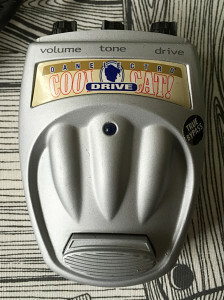 Danelectro CO-1 Drive from Cool Cat series. Made in china, late 00’s. Last one i had missing from my Cool Cat series collection. Pretty rare specimen actually. Finally found one from polish auction site and a friend delivered it. I’ve seen only couple of units on sale, mostly in US and with no shipping to europe. This makes me think the number of unit manufactured before switching to V2 were modest to say at least. 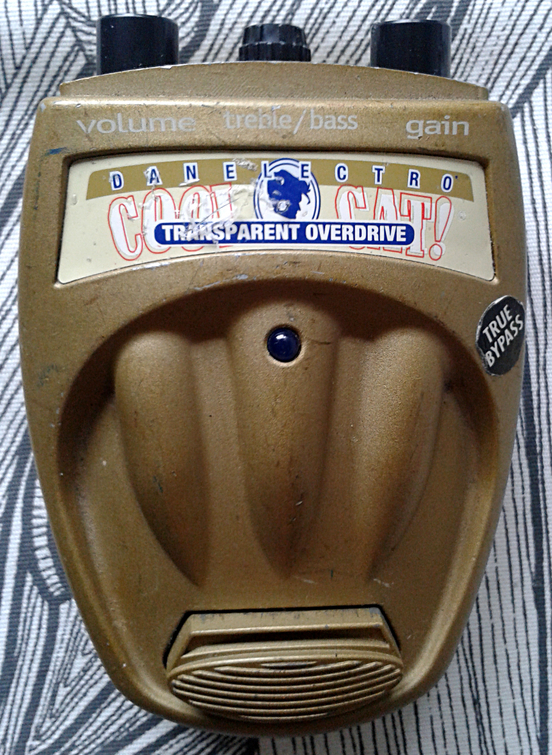 The rumour was (and still is i guess,) that the CO-1 Drive is supposedly straight up clone of certain OCD and due to OCD trademark owner’s active protection of his intellectual property, Danelectro was somehow forced to revise the design. All this is just a speculation i’ve seen on the web. Truth is that the unit is pretty nice pedal. Even if it was a straight up clone, (which it obviously isn’t,) the original OCD is not exactly original either. The release of V2 sure did keep this assumption of plagiarism alive. Well. 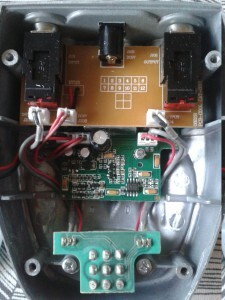 There is a Cowprez traced schematic up on FSB (link may require user an account), which shows the circuit being rather close to the one mentioned above. 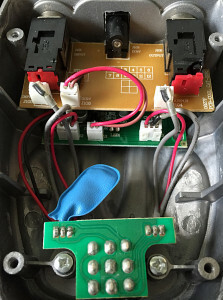 Plus the CO-1 doesn’t have a switch for so called hp/lp modes, so the similarities end at the base sound and parts of the topology, mainly around the main driver circuit. But then again.. How many TS style circuits are out there with minimal chages to the original? Or i could simply take this to another direction. 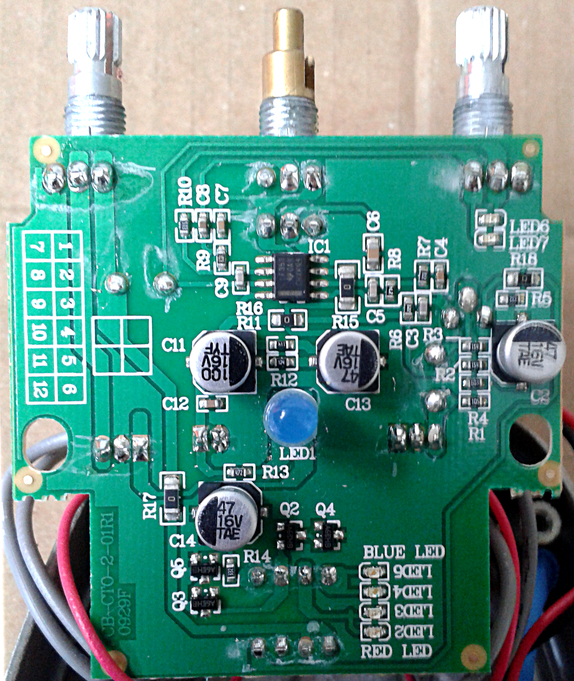 The electronics inside the CO-1 Drive are extremely close to classic Voodoo Lab Overdrive, with added tone control. This could probably take your mindset away from the later boutique brands. 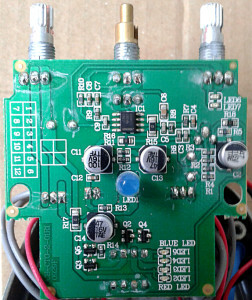 As for the rest of the pedal, we have our standard 3PDT true bypass and two small, stacked boards in a sturdy housing. 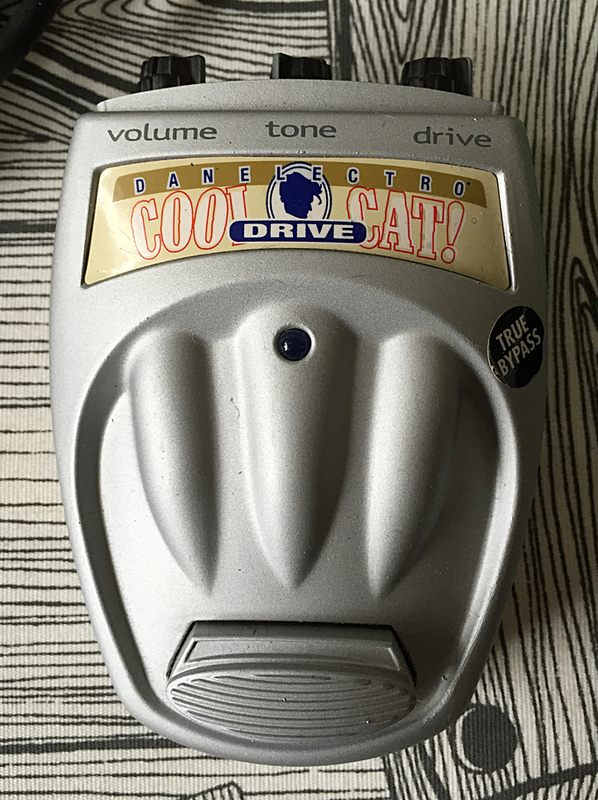 In all, this is very decent driver/distortion. Pretty much exactly like with the others in the Cool Cat series. Open boutique styled drive pedal with nice amount of gain on the knob. Output level is also sufficient to actually drive your amp instead of just clipping the signal. Tone control range is also quite usable. It may very well save you from too bright amp/speaker combinations, as well as help you boost your top end. There’s very little negative to say. 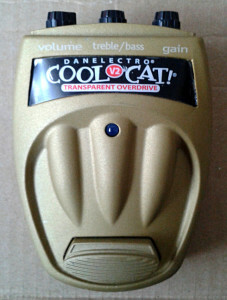 Danelectro CD-1 Distortion from Cool Cat series. 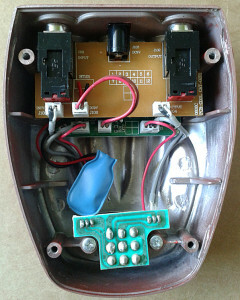 Made in china around 2009. The number of good sounding units in this series seems to be on the rise. Took me a while to get one and to tell the truth, this didn’t come too cheap either. But i wanted one, so i went out and got one. Simple as that. One part of the attraction was that all there was on the internet was just a couple of guesses about what the circuit could be. Usual guesses pointed out this being a derivative of the “standard” Danelectro distortion, the Fab Tone from original series. Granted, that design may have been circulating in the brand’s catalog more than enough. But. Since there were nothing more than guesses based on nothing around, i felt it like a duty to shed a little light on this subject. I’ll say one thing before going any further. The box feels and sounds nothing like the Fab Tone. Opening the box up, no surprises at this point. 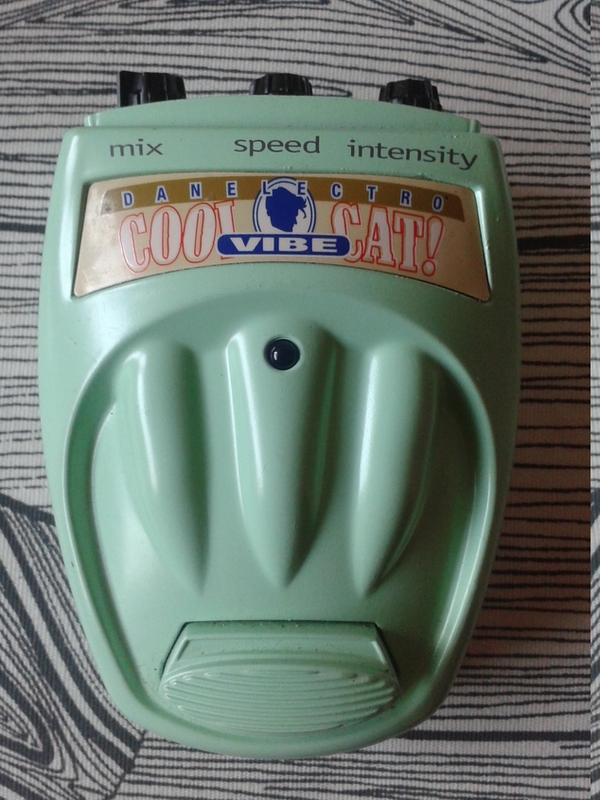 Just a standard Cool Cat series jack and switch board inside. But as we all know, the effect itself is on that other board. 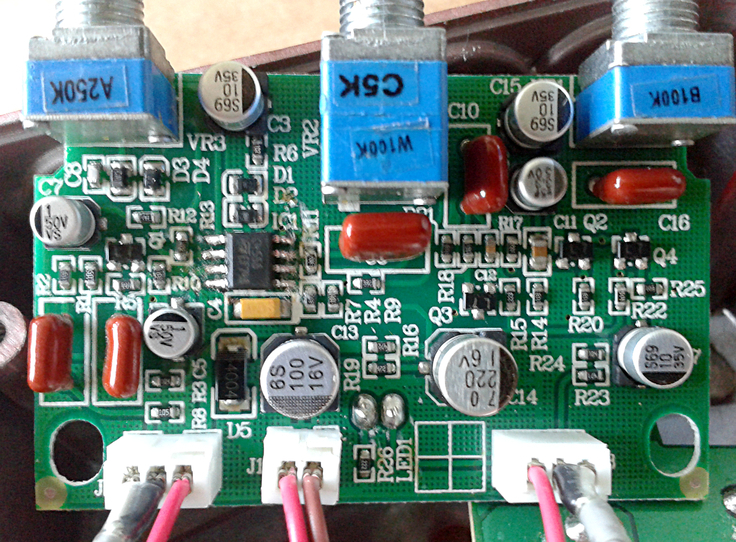 Four transistors and a dual opamp. At first glance, the first transistor looks like it’s a buffer, and there’s two separate pairs of clipping diodes. Nope. No clue about what’s it based on, at least not just by taking a quick look at it. 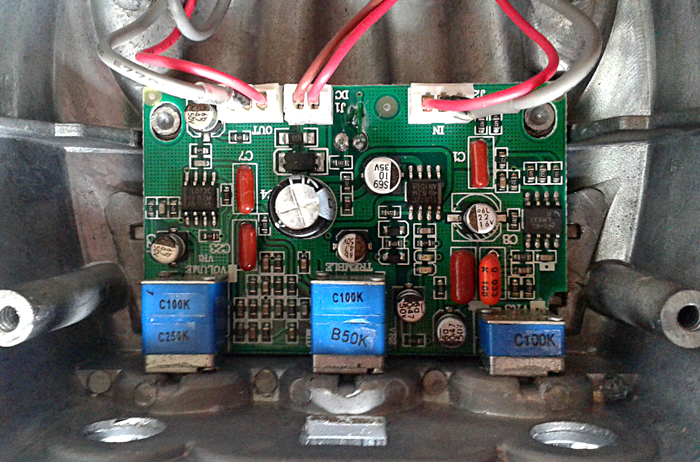 But several hours, a multimeter, a few liters of coffee and several packs of smokes. Yup. Now we know. At first the design didn’t ring any bells, even though it should have. So, we have an input buffer, followed by a non-inverting clipping amplifier with diodes in feedback loop. Then we have hard clipping stage, followed by dual gyrator-based tone section and a buffer for output. Design is, in other words, pretty impressive distortion design. At the moment of my trace it really should have been obvious to me. Anyone ever heard of a distortion unit called Distortion Master? Here we have that, almost verbatim, with slight modifications on the tone controls and the gyrators they control. May that mean whatever, but still, we have $200 sound in $40 package. Very good. Not too far from those distortions that try to capture the feel of old Marshall amps pushed to the max. Not too high in gain, but well balanced and sufficient. 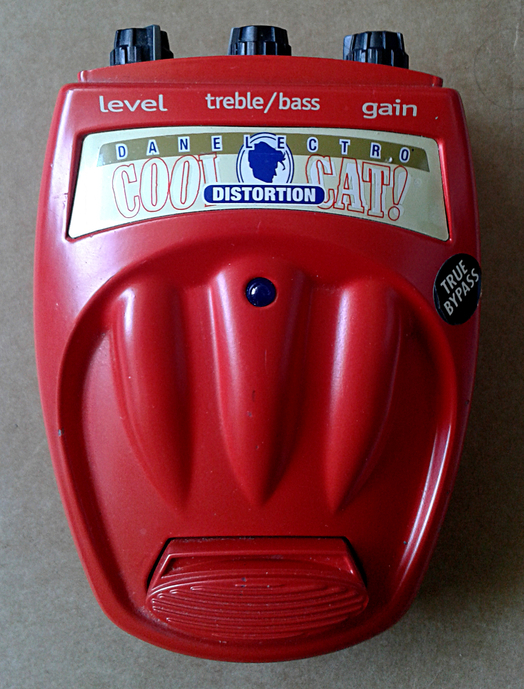 Gain control goes from overdrive tones to big distortion sounds. EQ section works well and sounds like you really don’t have any need for a separate mids control. I would go so far to call this one of the greatest rock distortions. In one word, usable. But we should remember it is heavily based on an existing pedal that is currently manufactured. Still. Wonderful sound to have in one’s toolbox of sounds. 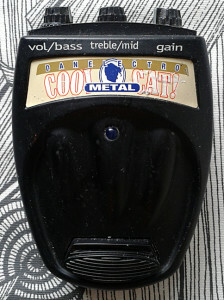 Danelectro CM-1 Metal from Danelectro Cool Cat series. Made in china late 00’s. Another metal distortion. While Dano’s Cool Cat series has pleasing and personal enclosure, most designs seem to be simple rip offs with very little original in them designwise. Currently i’m not sure what this particular unit based on, but everything about it is pretty much on par with all the other units in the series. We’ll find three separate boards inside. 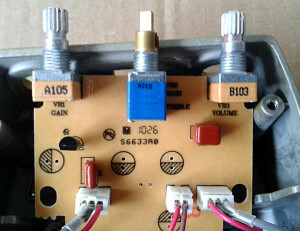 One universal for 3PDT stomps switch, one for in/out/dc jacks. These boards are, like i said, universal and the same ones are used throughout the series. The bottom board is the effect. 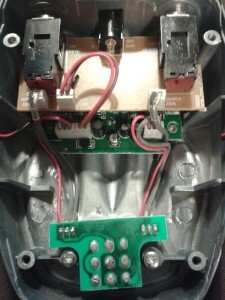 Construction is mostly SMD with couple of the caps being metalized polyester. Three oapms are running the show. I’m pretty sure this is a slightly modified derivative of some other pedal. Just can’t point my finger to any directions right now. While it may look pleasing, the control knobs are horrible. Sure they are meant to be “set and forget”, but that set once part is killing me. Dual pots with stacked concentric knobs are not a bad thing if executed like in many boss pedals. Here, the turning of the either level usually results in both setting being shifted. Annoying. I’d be rather interested to find out what this is based on. If you have any solid information, drop a line in the comments. I may study the connections at one point. If i happen to get interested enough. To sum it – Standard metal distortion. Not bad, but not too great either. Like so may other motal distortions. EQ section is powerful and gain plus level setting are sufficient. The overall tone reminds me a bit of Boss HM-2, but here we have separate mid control. I do find this usable metal distortion, but it’ll always stay behind HM-2 and HM-3. I’d say this goes to the same category with DOD American Metal and Death Metal. Again, not bad, but not too great either. 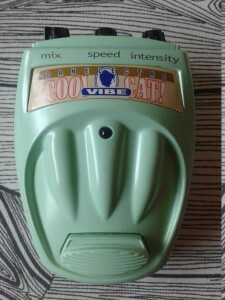 Danelectro CV-1 Vibe from Cool Cat Series. 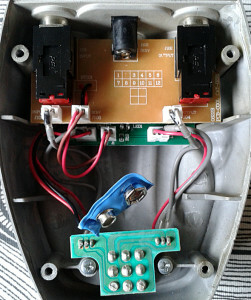 Original version, no level trimmer under the battery slot. I did get pretty far with my collection without having a single vibe-only pedal in it. This unit finally changed that fact. 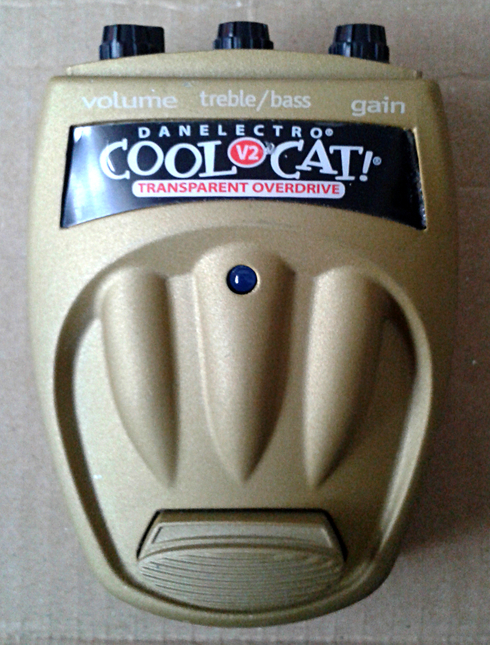 Danelectro made a number of itself with the vibe from its mini series. And for a good reason. It was very cheap and very good sounding vibe that many people simply true bypassed and rehoused. The success of mini-series univibe clone set pretty high hopes for this unit too. This is also an good unit, but it has couple of reported faults. The first issue is with the delay of wet signal. 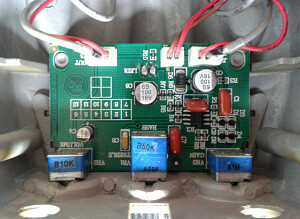 I do get the idea of disconnecting power from the circuit when bypassed. But it is a very stupid idea on a circuit which operates on four LDR (light dependant resistor) stages that all need notable amount of current. Yes, that’ll save you from swapping the battery every 4 hours, but then again – who uses batteries anyway? Now, when we cut the power and push it back on when bypass switch activates the circuit, there’s bound to be a short, less than half a second delay before all four LDR stages are running properly. That is a fault. Not that it would bother me in any way, but that still is a fault. Second issue reported is the rise in output level when activated. 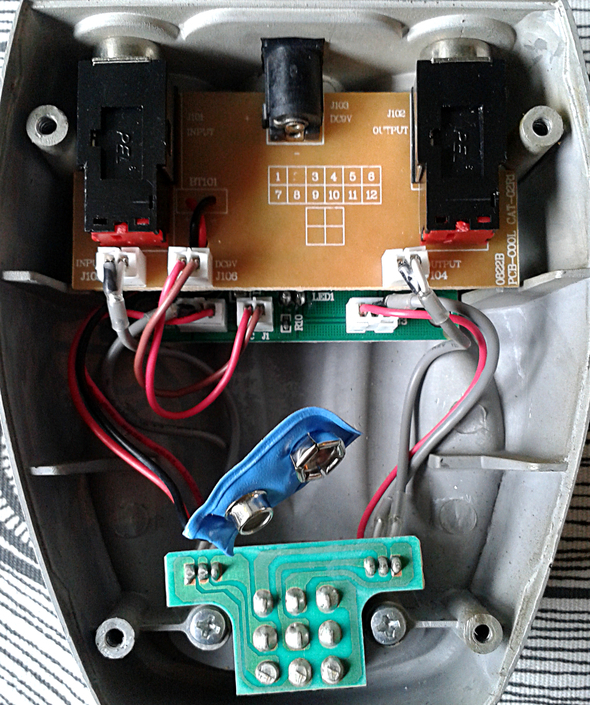 Later units have a trimmer pot under the battery slot, which lets you adjust the level to perfect. The original units don’t. 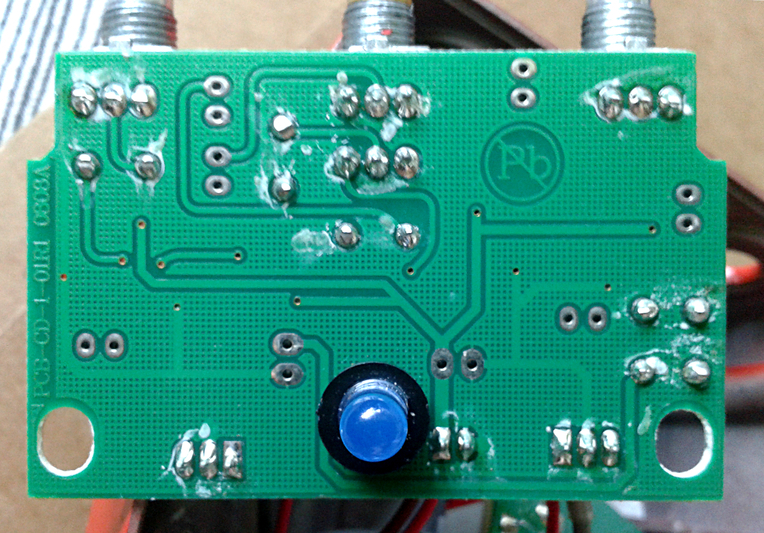 The issue comes from the dual opamp seen on the gut photo’s main PCB on lower right corner. That simply applies slightly too much gain for the output signal. This is another issue that doesn’t bother me at all. But someone who would use this vibe as a everyday effect on his/her board, would suffer from these faults. 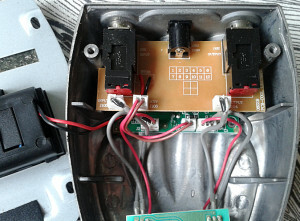 Two “errors” on one design has never been a good thing for the pedals (nor for manufacturer’s) reputation. And this is that reason. The overall sound is very close to the classic Uni-Vibe, but here we have added personality and overall feel of the sound is slight darker. Three controls can tune it from mild phaser-like atmospheric slow sweeper to super-wobbly wild child. Both extremes take the whole signal and put it through the blender with your morning smoothie. For the price and construction (disregarding the two faults), this is in fact a very good catch. One should still look for revision two, rather than the original. For me, i’m keeping this as is. 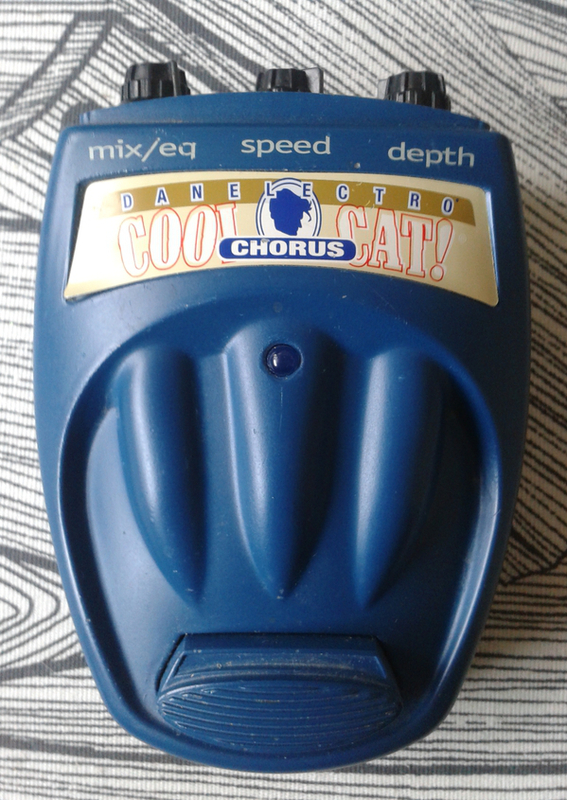 Danelectro CC-1 Chorus from Cool Cat series, made in china around 2004. Got this unit used for a very reasonable price. That reasonability ended once i openend the parcel. Bottom was velcroed and the type plate was long gone. Those do not contribute to the sound in any way, but i’m usually after pedals that are in good or better condition (unless they are more rare and more collectible). As this series is not at the highest spot on my collector’s list, i think i can live with the faults. It is quite interesting how and why most manufacturers choose blue as a colour for their choruses. Dark or light, but most of them are blue. If not blue blue, then light or dark, but still blue. The Danelectro method of creating effects has mostly been interesting. 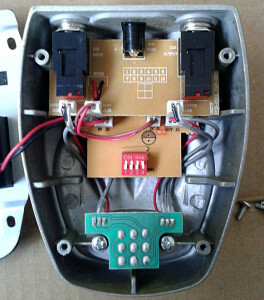 If you take a look at any board from the “original” series or from mini series, you’ll notice that the boards are designed and cut per the enclosure. 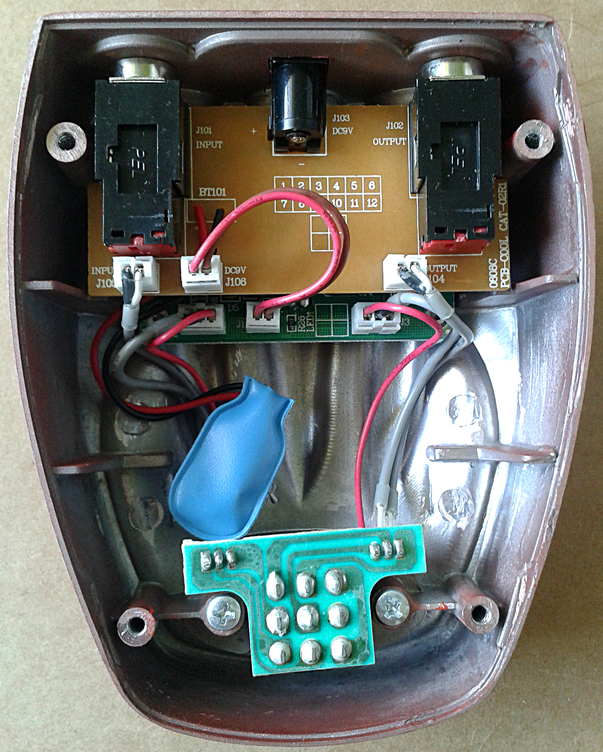 Rather than making the enclosure to house the circuit. In this case the two stacked boards are really small and leave a room for a battery in the middle. Next issue i’m going to need to raise with these boxes is the switching. 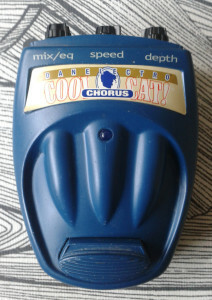 Danelectro had a long experience in electronic switching which wasn’t that bad at all. Only couple of the mini series boxes were reported to be sucking the bypassed tone, but when we leave the plastic momentary switch solution aside, the switching was (and still is) not bad. So the choice to go for sometimes unreliable 3PDT standard true bypass leaves me puzzled. Will it make the effect better than its electronically switched, buffer bypassed peers? Good with quite wide range of settings. it has your standard depth and speed controls in addition to “mix/eq” control which acts more like a mix than eq. Nice cheap pedal. Nothing to shout about, but well working and reasonably good sounding chorus. Small footprint for pedalboards can be counted as a plus. Entries (RSS) and Comments (RSS). 46 queries in 0.155 seconds.